LONDON, July 27, 2010 (AFP) - Britain could cut funding for half its sports at the London 2012 Olympics if the government orders another budget tightening, an official warned Tuesday, two years before the starting gun is fired. Peter Keen, the sports official charged with improving Britain's record fourth place in the medals table at the Beijing Olympics, told the Guardian newspaper he was braced for a spending review in the coming months. 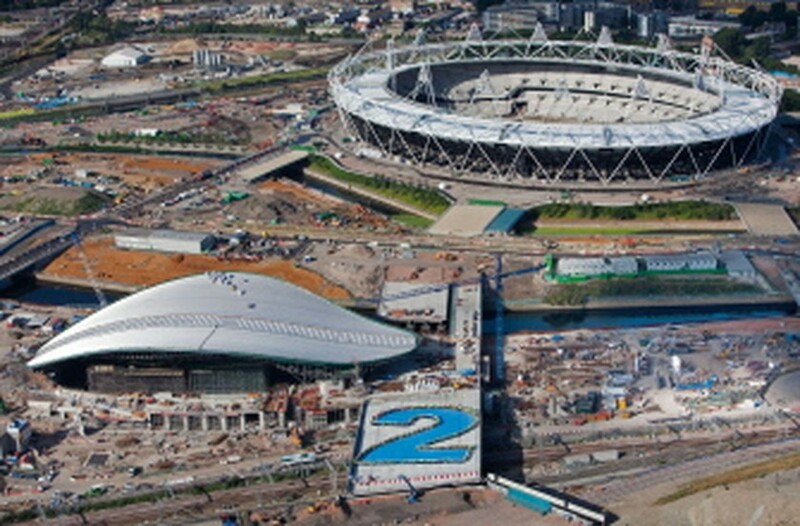 A handout aerial photograph dated July 21, 2010, shows construction workers on the site of the 2012 London Olympic and Paralympic Games in Stratford, east London, made available to AFP in central London on July 26, 2010. He said he would be willing to divert money from 50 percent of sporting bodies to athletes who have a more realistic chance of success. His comments came as Britain marked two years until the start of the 2012 Games, with Olympic greats testing out half-built stadiums in London as the capital showcased the preparations it has made so far. "Like all publicly funded organisations, we'll soon hear our budget," said Keen, who is director of performance at the government agency, UK Sport. "We're 50 million pounds (77 million dollars, 60 million euros) down on the original budget we had in 2006. It was a 600-million-pound investment and it's a shame we don't have that now." "With any reasonable budget we will give the backing those [prospective medal-winning] athletes deserve," he added. "And so if that means we can only fund half the sports then that's all we can do." Priority would be given to sports with a reasonable chance of winning medals, such as cycling, athletics, rowing, sailing and swimming, he said. Britain's new coalition government has unveiled a series of deep spending cuts as it fights to reduce a record deficit.